Billy Heath demanded more desire from his FC Halifax Town team ahead of their FA Cup clash at lowly Ashton Athletic on Saturday. 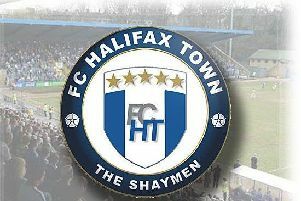 Heath criticised the attitude of his players after FC Halifax Town slumped to a 3-2 defeat at Gainsborough. First-half goals from debutant Alex Simmons and Liam King were cancelled out by two from Jordan Thewlis and one after the nreak by Ashley Worsfold. Heath felt all three of the hosts’ goals were avoidable and slammed his side’s defensive performance. “The first 45 minutes on the ball was probably the best we’ve played all season,” he said. “But it’s not how you play, it’s the result you get and we’re just so disappointed about the three goals (conceded), because all three are poor, poor goals. “The first one gets put into our box, 12 yards out, and there’s no-one around him. “To concede the second goal when we did is so naive it’s frightening. “Even the third one - you don’t give away silly free-kicks. People go down very easily nowadays. Just stand up. We had enough bodies there. Heath said his team should have been ahead at the interval, but felt his players didn’t show enough desire to win the game. “We dominated - we could have been two or three up in the first 20 minutes,” he said. “Liam King does what Liam King does, goes beyond and a great finish. “You think ‘let’s just see it through to half-time’ and then we go and give away another cheap goal because we don’t track a runner. “The problem we have is teams don’t have to do a lot to score against us. And that’s not just down to the defence. “We have to be more disciplined and we’ve got to want to defend as a group. “We were great on the ball but off the ball left a lot to be desired. “We don’t want to stop the opposition playing. We’ve got to get a lot better at that. “At times with us it’s ‘we’re going to play’ and then we allow other teams to play, and you can’t do that. “The players have to want to mark the man they’re supposed to be marking and stay with them. “That’s the easiest part of the game. But at the moment we don’t do the ugly things well. We just want to play football and that will get us nowhere. One positive was the debut of Simmons, on whom Heath said: “He did very well first-half. He was lively, he joined up with Dents when he could, he’s got good pace. “He faded a bit second-half but we didn’t feed him as much and we weren’t as dominant. Last season’s top-scorer Jordan Burrow was left on the bench until the 87th minute, about which Heath said: “We made the decision to put Peniket on.